Paul Clements finds an edible treasure trove on his doorstep in the unlikely urban locale of east London . Where I live in Londonâ€™s East End, itâ€™s a rare urban idyll. A minute from my door, thereâ€™s a convenience store; a minute in the opposite direction and youâ€™re on one of the last remaining wetlands in the capital. My kitchen overlooks a 90-acre nature reserve. With the window ajar, I can just make out the rattle of overland trains and, this being Hackney, the squeal of police sirens. Chris Bax, Countryfileâ€™s intrepid forager who teaches at Taste the Wild, the woodland-skills school in North Yorkshire, thinks I can find fresher and more interesting produce on Walthamstow Marshes than in my local shop, so Iâ€™ve invited him to show me how to find it. We could do with a supermarket basket for all the goodies heâ€™s about to find on the verges, in the hedgerows, hanging from trees. By the marshland footpath, he spots a tall, silvery plant. He rips off a flower head, scrunches it, and takes a deep sniff. â€œMugwort,â€ he says. â€œCrush it and youâ€™ll get citrus first.â€ The heady lemony aroma is, to me, not unlike Fairy liquid. â€œBut itâ€™s also full of umami,â€ he says â€“ the hallowed â€œfifth tasteâ€ (after salty, sour, sweet and bitter) often translated from the Japanese as â€œsavourinessâ€. Some of the countryâ€™s more adventurous Michelin-starred restaurants, such as Lâ€™Enclume, on the edge of the Lake District, are doing their bit to bring it back into culinary circulation; chef Simon Rogan has used mugwort to prepare duck and suckling pig. You canâ€™t buy it fresh in supermarkets â€“ but itâ€™s growing for free and unnoticed by the River Lea. Moving on, Chris finds a patch of yarrow, a â€œbitter but prettyâ€ culinary herb with fronds shaped like a feather. 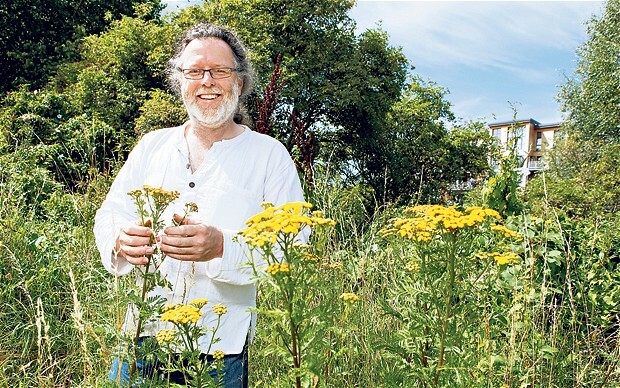 â€œItâ€™s amazing just how many urban weeds are edible,â€ he says. â€œThis you can just chuck into salads.â€ A mallowâ€™s leaves are full of mucilage, he tells me â€œa gummy substance thatâ€™s great for thickening soupsâ€. We alight upon a batch of comfrey, a pretty, purple-flowering plant with furry, cucumber-scented leaves â€“ but with potentially carbolic properties if digested in great quantity. Fittingly for this urban area of London, he pulls out his iPhone and shows me a free downloadable app that has descriptions and full-screen pictures to help autumn foragers identify plants. The Wild Jam Maker app by Stoves lists edible fruits and berries that can be found in the wild â€“ making plants such as rowan, medlar and blackthorn easily recognisable at a glance. â€œItâ€™s the ideal reference tool for amateur foragers,â€ says Chris. Chris is even more taken with his latest discovery: a cobnut tree. â€œEat them green, before theyâ€™re hard and need cracking,â€ he says. â€œWhen theyâ€™re sweet and young, scrape out the flesh and make it into a pesto with some Wensleydale, wild garlic, nettle, hazelnuts and rapeseed oil.â€ He makes it sound so easy â€“ and delicious. Thereâ€™s another muffled squeal when he spots an oak heavy with acorns. â€œA classic nut,â€ he says. â€œTheyâ€™re too good to just feed to pigs. You can make them into a flour if you bleach out the tannins first by boiling them in two changes of water, then bake them before grindingâ€¦â€ As if someone like me, who buys chickpeas in tins because lifeâ€™s too short to soak things overnight, is ever going to do that. But he keeps trying to convince. During our hour of intense foraging yards from my door, Chris singles out almost two dozen different herbs, fruits and nuts that Iâ€™d never noticed before. I now have cobnuts drying in bowls on window sills, grated horseradish root infusing in oil (â€œitâ€™s knockout on Asian dishes, and youâ€™ll only need a few drops to get that wasabi kickâ€) and bottles of elderberry cordial in the fridge for winter. Iâ€™ve added wild pea shoots to salads, brewed minty flavoured tea from white dead nettle and cooked up vatfuls of hedge jelly from all those seemingly wasted rosehips, sloes and hawthorn haws (see recipe). At this rate, Iâ€™m just a wheat shortage away from milling my own acorns into flour.